You’ve Been Accepted…to the Explorer Academy! Welcome to Day #6 of the Explorer Academy: The Nebula Secret Blog Tour! 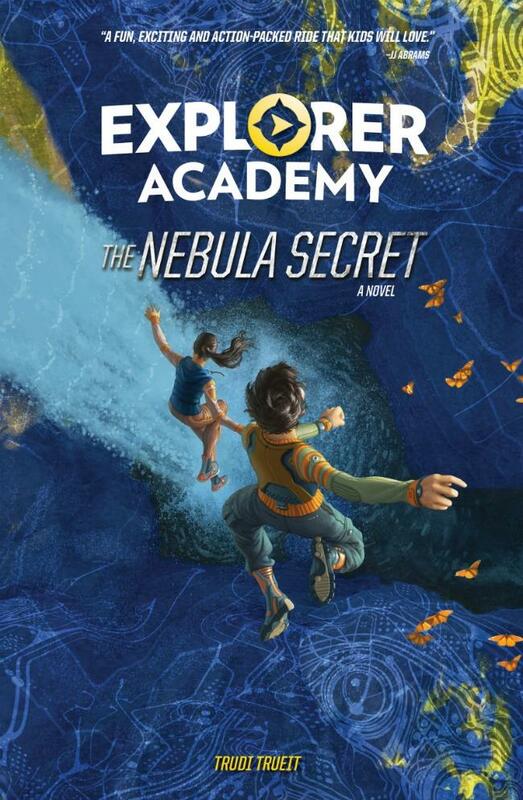 To celebrate the release of Explorer Academy: The Nebula Secret by Trudi Trueit on September 4th, blogs across the web are featuring exclusive content from Trudi and the Explorer Academy team, as well as 10 chances to win a copy of Explorer Academy: The Nebula Secret and swag! This adventure book for kids is great! I know your middle grade readers will love it. When Cruz and 23 other kids from around the globe begin their first day at Explorer Academy, they are each assigned to a team named after a famous explorer: Cousteau, Earhart, Galileo, or Magellan. The teams are meant to inspire kids to work together and each namesake offers its own special inspiration. Fast facts: Jacques Cousteau was a French explorer, inventor, and filmmaker born in 1910. As a young naval officer, Cousteau discovered that he loved diving and the sea. He fought in World War II as a gunnery officer and was a member of the French Resistance against Germany, earning him a Legion of Honor award. Together with an engineer he created the first fully automatic compressed air Aqua-Lung, which allowed divers to swim freely underwater for an extended period of time. Yes, S.C.U.B.A. gear! Throughout his long career he created more inventions to help explore the ocean’s depths, but is perhaps best known for his many films and books that brought his message of caring about the sea and its creatures to millions of viewers and readers around the globe. Fast facts: Amelia Earhart was a trailblazer from the start. Born in Kansas in 1897,Earhart worked as a nurse and a social worker while pursuing her love of aviation. In 1928, she became the first woman to fly across the Atlantic Ocean and piloted an autogiro to a record-breaking 18,415 feet (5,613 m) in 1931. In 1932, she crossed the Atlantic alone in her Lockheed Vega and completed it in record time (14 hours 56 minutes). But it was while attempting her greatest feat yet —a journey around the world—that she disappeared. On July 2, 1937, Earhart and her navigator Fred Noonan left Lae, New Guinea for Howland Island, a 2,600-mile (4,200-km) journey. Neither Earhart nor her navigator were ever seen again. Some theorize that she might have been a castaway on Nikumaroro Island but the evidence is inconclusive. Fast facts: Galileo Galilei was born in 1564 in what is now Italy. He was a natural philosopher, astronomer, and mathematician, and even a physicist – what today we’d call a true Renaissance man. He was famous for emphasizing the connection between nature and mathematics, and was a huge advocate of the heliocentric solar system (the sun at the center), which landed him in a lot of trouble with the Catholic church. After learning about a device that enabled one to see objects far away that was invented in the Netherlands, he crafted a similar contraption through trial and error. Galileo noted many things with his telescope—sunspots, four of the moons of Jupiter, the rings of Saturn, the phases of Venus, and the rocky surface of the moon. Fast facts: Ferdinand Magellan was born in Portugal in 1480. In 1519, he set out under the Spanish flag to find an easier route to the ‘Spice Islands’ (now known as the Maluku Islands, which are part of modern-day Indonesia), at a time when there were still many myths about Earth’s geography. Some believed that the world was flat, though scientists and great thinkers had known for a long time that it wasn’t. Magellan endured many hardships, from a lack of fresh food to multiple mutinies and desertions. Though he is popularly known as being the first to circumnavigate the globe, he never achieved that goal. The journey proved more than he bargained for, and he was killed in the Philippines before he could return in triumph. The only one of his five ships to survive the journey eventually made it back to Spain in 1522, and it was more than 50 years before the circumnavigation feat was again attempted. Astronomer, biomedical scientist, climate change scientist, conservationist, engineer, geologist, herpetologist, inventor, linguistic anthropologist, marine biologist, materials architect, oceanographer, paleoanthropologist, paleontologist, scientist, science photographer, technologist, wildlife photographer, and so many more! Wonder what kind of explorer you’d be? Take the explorer personality quiz! Already have some great adventures in mind? Let us know in the comments below or email us at exploreracademy@natgeo.com. Adventure, danger, and a thrilling global mission await 12-year-old Cruz Coronado as he joins an elite school for explorers.Cruz leaves his tranquil home in Hawaii to join 23 talented kids from around the globe to train at the Explorer Academy with the world’s leading scientists to become the next generation of great explorers. But for Cruz, there’s more at stake. No sooner has he arrived at the Academy than he discovers that his family has a mysterious past with the organization that could jeopardize his future. In the midst of codebreaking and cool classes, new friends and augmented reality expeditions, Cruz must tackle the biggest question of all: Who is out to get him, and why? 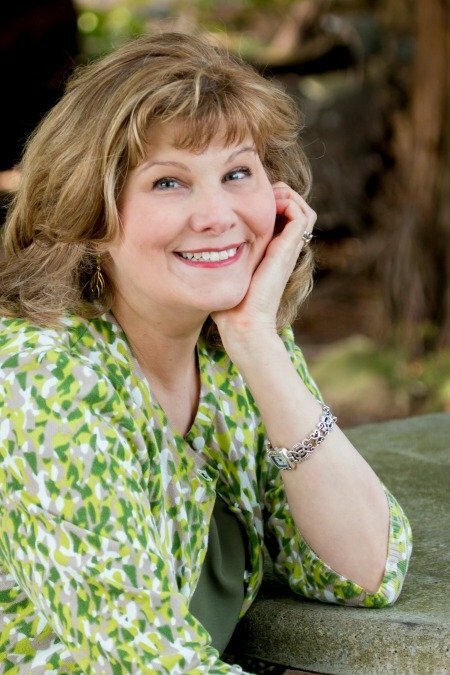 Author Trudi Trueit is a gifted storyteller for middle-grade audiences. She has written more than 100 books for young readers, both fiction and nonfiction, including The Sister Solution, Stealing Popular and the Secrets of a Lab Rat series. Trueit lives in Everett, Washington. Join Explorer Academy author Trudi Trueit and National Geographic explorer and venomous snake researcher Zoltan Takacs as they discuss the book series and answer questions from readers. Trudi will sign copies of the book as well. * Please note, Zoltan Takacs will not attend this event. Enter to win a once-in-a-lifetime trip! One lucky family of four will embark on a spectacular ship-based adventure, just like the students at Explorer Academy. Experience the remarkable beauty of Alaska’s famed Inside Passage on this thrilling 8-day voyage, courtesy of National Geographic Expeditions. This giveaway is sponsored by National Geographic Expeditions. This blog is not responsible for prize fulfillment. I’m sharing this as a courtesy. Get up close to icebergs and calving glaciers. See orcas and humpback whales, then listen to them with the ship’s hydrophone. Visit Glacier Bay National Park, learn about Alaska’s rich Native American heritage, and pass islands teeming with wildlife, including brown bears, sea lions, sea otters, and perhaps the world’s highest density of nesting bald eagles. 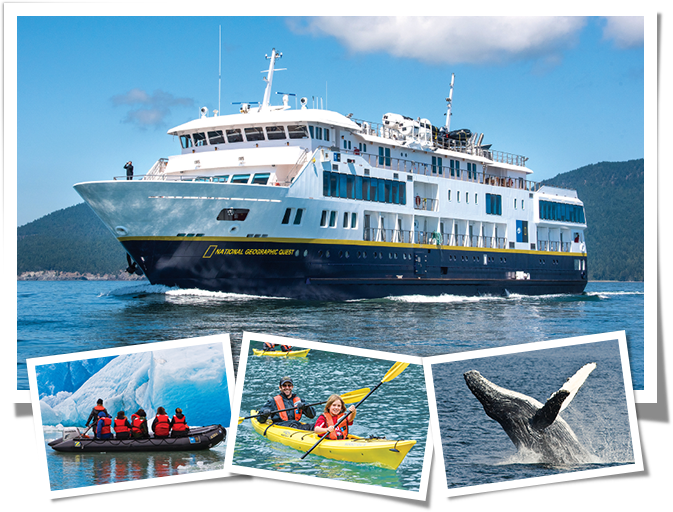 Visit natgeoexpeditions.com to see a detailed itinerary for Alaska’s Inside Passage Cruise. This giveaway ends 5/31/2019. Enter here! I am a WILDLIFE PHOTOGRAPHER. I would be a wildlife photographer. I would be an OCEANOGRAPHER :)! I would be an inventor.